Objective: To attempt to make donuts without xanthan gum. It’s part of my attempt to understand gluten free baking chemistry, using Ratio and other handy cookbooks. Hypothesis: It should work, since the hot oil should help gelatinize the starch and help hold it together. Results: As soon as the batter hit the oil, it split into many tiny droplets that looked a lot like rice crispies (or, more specifically, Spaetzle). Conclusion: No. No, you cannot omit the xanthan gum. It needs it to hold the batter together long enough to cook. The day this book came, it promised to change my world. To expand my horizons. To let me finally understand baking and invent my own recipes, just as I’d always wanted. 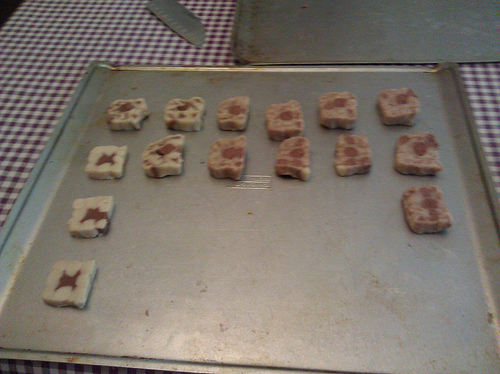 It’s like design patterns, but for baking! There was just one problem — I had just gone gluten free. So for two years, this book sat on my shelf, brutally mocking me. It was like seeing the holy grail, and watching it slip away from my grasp. Going gluten free was hard for me in a lot of ways. A lot of my favorite foods contain gluten. I was getting really into baking my own breads for the kids. Baking was sort of an essential part of the whole Home Is Possible experience — eating authentic, homemade recipes instead of mass produced junk. It was especially rough when I was pregnant with gestational diabetes and I couldn’t fall back on lite bread sandwiches or cheese and crackers. Piles of rice and rice noodles were right out. Over time, I learned which gluten-free mixes I liked better. More companies started making their own gluten free versions of things — Bisquick and even Betty Crocker. But I really did not like using them. I never used the gluten versions. I didn’t use them even when I was a kid. Every summer as a teenager, I worked my way through the pastry cookbooks. The week I discovered pate a choux was especially tasty. Baking is like all the chemistry and biology labs I did in school, only instead of threatening me with acid burns and cancer, I got to eat the result! Box mixes were better than no bread or cookies at all, but it was a big step backwards from where I wanted to be. I was mostly happy with the Gluten Free Baking Classics book, making decent scones and pancakes. But it required a lot of starches and rice and seemed devoid of any nutritional value, or even much taste. I wished I could bake with more interesting grains, like amaranth or teff. I could search for recipes on the internet, but it was like finding a needle in a haystack to find recipes I was really interested in — I’m picky. I don’t like cranberries, or sunflower seeds, or various other things people are always putting in gluten free foods. Or recipes would be gluten free, dairy free, egg free, and soy free… which is great if that’s what you need, but I wanted something more like what I made as a kid. So, two nights ago, I discovered something amazing: The Gluten Free Ratio Rally. Apparently, Ratio works for gluten free flours too. In fact, it works perfectly — the gluten free flours have a different density than wheat. That’s why you can’t just interchange them. I read the recipes for hours, hardly daring to believe it could be true. I could understand the secret of gluten free baking! And not just that, but apparently xanthan gum isn’t even really required for most of it! I could hardly wait to try it myself. But it was midnight. And I didn’t have enough flour. But mostly the flour thing, I think. The baking was forever. I tried a bit before it even cooled. I glzed it before it was cooled. Heck, we ate it before it even cooled, because I had to know if it could possibly be true! The Boy wanted seconds. That is all the data required to know it was a resounding success. It’s moist on the inside with a delightful little crumb. 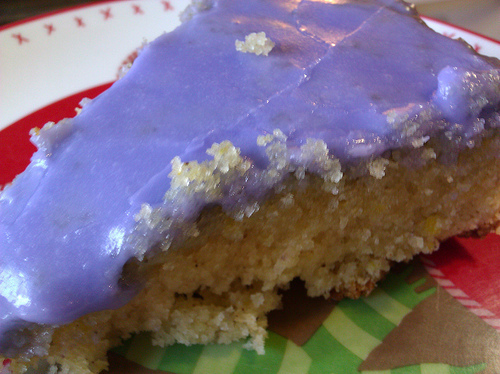 The edges are a little chewy like a great pound cake gets (and like box mixes never do). It tastes… like cake. Like the birthday cake my mom always made when we were kids. I can imagine adding all sorts of things to this cake. Nutmeg or cinnamon. A citrus glaze. Chocolate. Layers. The possibilities are endless. Just like I always wanted. Even better — I now have the tools to convert my favorite old recipes, such as the families treasured Christmas cookies. It’s traditional! Whisk eggs, sugar, salt, lime juice, and vanilla until eggs are 3 times original size (a few minutes). Fold in dry ingredients, gently. Pour into 9″ round cake pan and bake 30-45 minutes.